Singita Sabora Tented Camp dishes up lavish doses of romance, exploration and intrigue in Singita Grumeti, Tanzania. Proudly settled amongst the beauty of the grasslands, surrounded by plains and game, the 1920’s explorer’s camp is close to nature and reminiscent of a bygone era with nine 1920’s-styled tented suites with private bathrooms. Singita Sabora Tented Camp enjoys a spectacular, elevated setting in an exclusive area that spans over 350,000 acres (142,000ha) along the Western corridor of Tanzania’s legendary Serengeti. Surround yourself with the safari in one of the nine en-suite, air conditioned tent, beautifully decorated with antiques and artifacts of Tanzania. Zanzibar chest, Maasai blankets, and Persian rugs ornately cover each tent. 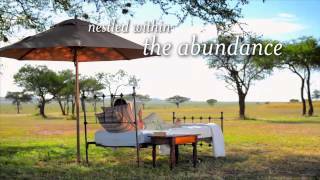 Additionally, the tents provide private access onto the plains where day beds, relaxation, and wildlife await you. Game Drives: Hop on board an open-air Land Rover for and experience Tanzania’s wildlife first hand. Whether you’re and early bird or a night owl, day and night tours are offered every day. As you drive through the plains of the Serengeti, have close encounters with cheetahs, bearded wildebeests, Maasai giraffes, and Colobus monkeys. Guided Safari Walks are also available. The Grumeti Fund Community Outreach Program: Guest are invited to visit the neighboring villages to experience the success of this community outreach program. The Grumeti Fund Community Outreach Program works with the residents in 21 surrounding villages to help with issues like: education, natural resource management, enterprise development and water management. Spa: Treat yourself to Mwarobaini ‘Healer of 40,’ taken from a medical Swahili tree. Another signature spa treatment is Ndzi Lorhe Africa (Dreamed of Africa); the experience begins with a full body exfoliation, followed by a soothing body wrap, and finishing with a unique Uhai balancing massage. Other holistic and healing treatments are available as well. Other: Stay busy with on-site activities like taking a dip in the swimming pool, getting a bullseye during an archery lesson, or working out at the gym. Boutiques/Galleries: Pick up one- of-a-kind souvenirs at the curio shop where you will find irreplaceable African treasures. Bring the safari home with printed tapestries, jewelry, and painting all made by local craftsmen.